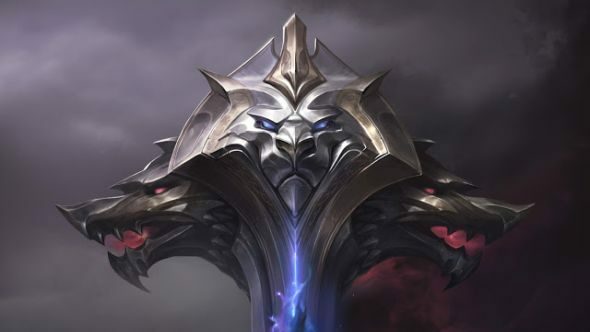 Riot is teasing a new League of Legends… thing. The Lion and Wolf teaser appeared on the game’s German and Brazilian social media earlier today, but honestly, I’m not sure what it’s trying to tell us. And it doesn’t really seem like the fan base are either. The teaser shows a metallic lion’s head in the centre of the image, and two wolf heads on either side of it. The three heads all come to a point at the bottom of the image, where they’re combined in a magical blue glow. A translation of the text beneath the German teaser reads, “Two forces collide once more: The Lion demands an eternal reign. The Wolf hungers for endless war.” The teaser also offers a date: June 27. There are plenty of things that this could point to. The easiest one to jump to is a new champion, but with the release of Pyke in the last patch, I think that’s an awfully quick turnaround, so I’m pretty sceptical. That said, while there are plenty of wolf/dog-themed champions, there are no lion’s (unless you’re counting Rengar, which I’m not). The best guess I’ve seen so far is a new set of skins for Garen and Darius, as pointed out on Reddit. I can get behind that – the lion is in Demacian white and gold, while the wolves are in Noxian black and red. On top of that, the lion tapers toward a sword shape, while the wolves are shaped like an axe-head. A complete guess, going by the translation, is that it’s a faction/lore-style event for the game kicking off towards the end of this month. That would potentially explain the teaser text – Demacia is a proud, defensive, long-standing nation, while Noxus is deeply expansionist and war-mongering. Whatever it is, we’ll find out in a few weeks.